Focal launches Scala and Maestro Utopia III Evo speakers | What Hi-Fi? The first two models in the new Utopia III Evo range feature improved speaker drivers and crossovers, as well as enhanced finishes. French loudspeaker force Focal has announced a new special edition of its Utopia III range: the Utopia III Evo. 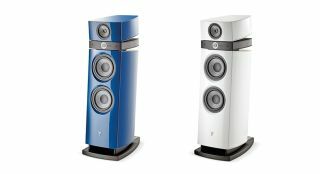 The first two speakers to get the Evo treatment are the Maestro Utopia III Evo (above) and Scala Utopia III Evo (below), which replace their non-Evo counterparts in the Focal catalogue. Both speakers feature Focal's latest acoustic innovations: TMD suspension and NIC (Neutral Inductance Circuit). TMD suspension provides a linear frequency response curve between 1 and 4kHz, while reducing distortion in this range. According to Focal, the mid-range register also benefits from remarkable neutrality. NIC, meanwhile, stabilises the magnetic field in a way that avoids harmonic distortion and intermodulation. Both speakers now offer bi-amplification possibilities too. This separates the bass and mid-range/treble registers, allowing you to fine-tune the sound by personalising the registers. The two crossovers have been separated within the enclosure, in order to avoid magnetic disturbance. Both are three-way floorstanding speakers, and both come in new colours: metallic blue, ash grey or British racing green, as well as the classic black lacquer or Carrara white. They will be available in August.